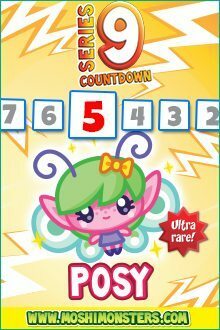 Yesterday within the series 9 countdown, was the turn of the cute star, Tessa, but today we have an even cuter little moshling on the blog; Posy the amazingly sweet, but very forgetful, little fairy. One of the rivals for the Pipsi crown of “cute.” She is a close second in the favourites in the KiddyCharts household. Little Posy is the terribly forgetful, but amazingly cute little flutterbye fairy; an if you meet her you might wan to remind her which way home is! As she is a fairy, then she is never too far away from a daisy chain, or a cup of nectar.